A very interesting study was published in the April 9, 2010 issue of Science.1 In this study, Matam Vijay-Kumar and colleagues experimented with mice, trying to find out how their immune systems interacted with their body weight. Scientists have known for a while that obesity and the immune system are related, but most scientists have thought that obesity causes immune system disorders.2 That might, indeed, be true. However, this study shows that, most likely, immune system disorders can also cause obesity! Mice (and most vertebrates, including people) have two levels of immunity: innate immunity and adaptive immunity. Innate immunity refers to the mechanisms in the body that protect against general threats. Adaptive immunity refers to the mechanisms in the body that protect against specific threats. So the mechanisms in the body that fight against all bacterial infections are a part of the body’s innate immunity, but when the immune system is attacking a specific species of bacterium, the adaptive immune system is at work. Matam Vijay-Kumar and colleagues investigated a very specific part of the innate immune system and its effects on obesity in mice. The results were quite surprising. In their study, they worked with mice that had a defective receptor, called Toll-Like Receptor 5. This receptor is designed to recognize the protein that makes up a bacterium’s flagellum and then signal the immune system to the presence of the invader. Since these mice didn’t have a working version of that receptor, they were more susceptible to general bacterial infections. They found that such mice were also obese. The question, of course, is why? Is it the result of the immune system directly affecting metabolism, or is it something else? Well, that’s where the study gets really interesting. They tried breeding the mice with mice that had disorders in other parts of the innate immune response related to bacteria, but the progeny stayed obese. That made it unlikely it was just a matter of the immune system interacting with metabolism. So the researchers tried something different, and in my opinion, inspired. They treated the original mice with antibiotics to kill the bacteria that live in their intestines. Remember, vertebrates have a mutualistic relationship with several species of bacteria. The bacteria take up residence in their intestines and digest things that the vertebrate cannot digest. In exchange for the food and housing, the bacteria produce beneficial things like vitamin K for the vertebrate. When Vijay-Kumar and colleagues killed off these bacteria, the obese mice became significantly thinner! In addition, when they took the thinner mice and reintroduced bacteria into their intestines, the mice became obese again. 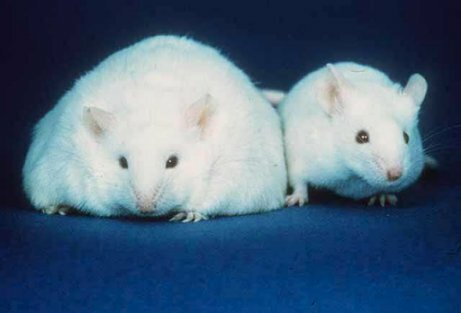 In the end, then, it wasn’t really the Toll-Like Receptor 5 that was causing these mice to become obese. Instead, the fact that the bacteria in their intestines were not being regulated by the immune system was causing the obesity. Now wait a minute. Aren’t these bacteria “good” bacteria? After all, the mice are in a mutualistic relationship with them. Both the mice and the bacteria benefit from them being there. Why would the immune system work against them? Well, remember that living things like mice are the result of the work of an amazing Designer. As a result, their systems are incredibly ingenious and well thought out. While a mutualistic relationship between the mice and the bacteria is good, it would turn bad if there were too many of the bacteria. Thus, a mouse’s immune system is designed to completely destroy the presence of bacteria in most parts of the body, but simply regulate the amount of bacteria in the intestine. But if the bacteria are causing the obesity, how are they doing it? Well, the study can’t precisely answer that, but it gives us a clue. If the obese mice with the bad Toll-Like Receptor 5 were put on a strict diet that regulated their intake of calories, they became thin again. The authors, therefore, suggest that excess food intake can be the result of some sort of interaction between the intestinal bacteria and the mice. In other words, the bacterial populations are affected by a mouse’s immune system, but the mouse’s behavior can also be affected by the bacterial populations. Of course, the obvious suggestion of the study is that by artificially controlling the intestinal bacteria of obese people, we might be able to help them lose weight. We will have to see if such research pans out, because there are a lot of differences between people and mice, even though their Toll-Like Receptor 5’s are very, very similar. What I find fascinating about this study is that it really does provide evidence for the idea that the population of a beneficial bacterium can actually affect the behavior of the host. If this is really true, it means that intestinal bacteria aren’t necessarily the “servants” we tend to think they are. Instead, they are more like “partners.” The host and the bacteria work together, interacting at a very fundamental level so that each is affected by the other in significant ways. What an amazing design! 1. Matam Vijay-Kumar, et al., “Metabolic Syndrome and Altered Gut Microbiota in Mice Lacking Toll-Like Receptor 5,” Science 328:228-231, 2010 available online with subscription.